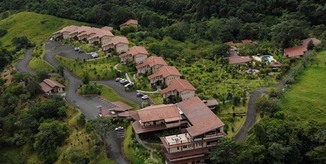 Arenal Kioro is the ultimate in luxury accommodations in the Arenal area. 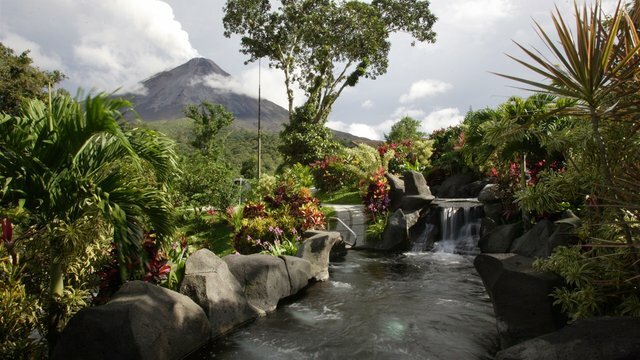 Its privileged location affords it incredible views of the Arenal Volcano from all 53 rooms, restaurant and open-air pool. The resort is conveniently located 10 kilometers northeast of the town of La Fortuna, gateway to the Arenal area, and less than 5 minutes from the Tabacon Spa. The 53 suites are complete with all the amenities you come to expect from luxury accommodations; king and queen sized beds with a separate sitting area with sofa-bed and 11 suites with king bed and sofa-bed, open air terraces with up close panoramic volcano and mountain views, in suite Jacuzzi, air conditioning, safe box, minibar, coffee maker, hot water, direct dialing telephone, satellite television, hair dryer, and key card safety locks. The Heliconia Restaurant, with an excellent view of the volcano is located in the main building and is beautifully decorated with tropical flowers from the gardens and beautiful coral stones tables. The owners have made the conservation of the environment an integral part of their motivation and as such have carried out environmental studies to cause as little impact as possible during the construction and operation of the project.